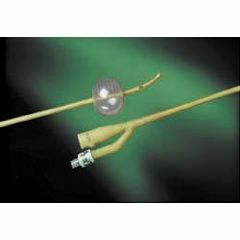 Bardex Lubricath Coude Catheter provides for smoother insertion and enhanced patient comfort through the hydrogel coating’s unique ability to absorb fluid, thus creating a hydrophilic “cushion” between the catheter surface and the urethra. Lubricath hydrophilic polymer coating helps reduce irritation of the urethral mucosa and helps minimize encrustation. Coude tip has a natural bend, designed for negotiation of the prostatic urethra. I use 30fr/30cc caths. Do you have these in stock or are they special order?